Photo by Jeff Hilnbrand, Clark School chapter of Engineers Without Borders. The Clark School chapter of Engineers Without Borders (EWB) has received a $5,000 University Relations Grant from Bechtel for its Ethiopia team. The money will be used for the team's trip to Addis Alem, Ethiopia, in January 2013. 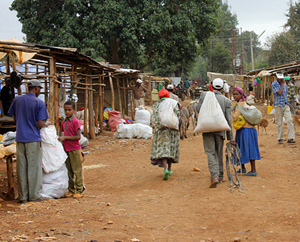 The marketplace in Addis Alem has issues with stormwater management, becoming very muddy when it rains. The water also spreads bacteria from the livestock in the marketplace. The EWB team will provide the community with a selection of solutions that they can test and replicate, including a riparian conveyance system, rain catchment systems on the marketplace stalls and a new stall design. EWB also received $1,500 from Boeing for an upcoming trip to Burkina Faso in January. The team there will look at the slow sand filter system they installed at a health clinic in Dissin last year, as well as other projects. The goal of the trip is to make sure all systems are still functioning and to fix any problems that exist.